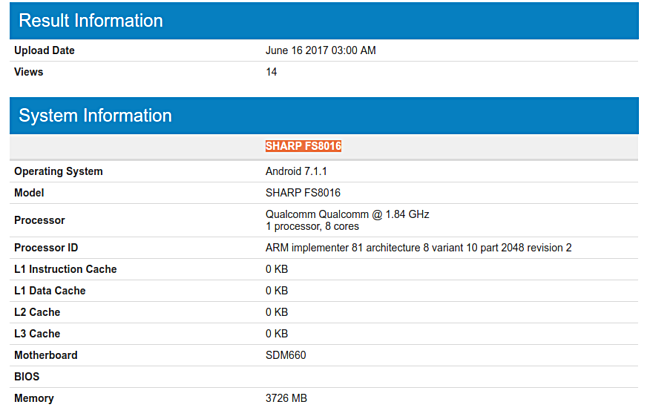 A new Sharp smartphone has been spotted in a listing on Geekbench. Listed as FS8016, the device is powered by Snapdragon 660 SoC with octa-core, 1.84 GHz processor, and packs in 4GB RAM. The listing also reveals the handset runs Android Nougat (version 7.1.1 to be specific). Sadly, nothing else is currently known about the FS8016. However, given that it has started appearing in benchmark listings, we expect to hear more about it sooner than later. I wish more Sharp models were available. I agree, but, those bezels at the top and bottom of the screen don't exactly scream au currant. Even though the Snapd. chipset is middle class, I think that Qualcomm should have added the ability to download at gigabit speeds. Probably this phone is successor to 5.5" Z2(FS8002) sold in taiwan.